This summer it has been a real treat to travel around the world visiting a new beach every Tuesday. We’ve been to both Long Beach Island, New Jersey and the La Maremma beach in Tuscany, Italy with Lisa Fantino. We saw the beautiful Giannella beach in Argentario, Tuscany with Katie Greenaway. Andi Perullo took us to two exotic and dreamy spots, one in Cuba and the other at the Isle of Pines in New Caledonia. Cherrye Moore brought us back to southern Italy by showing us Tropea’s tantalizing beaches, the Giovino beach and Soverato’s sizzlin’ beach in Calabria. And I gave you a peak at the beautiful Fornillo beach in Positano, right here on the Amalfi Coast. That’s a lot of beach time … I hope you had your sun block on! As the beach days begin to wane, this week I’ll be wrapping up my Tempting Tuesday beach series. But, on this last day of August, I just couldn’t resist sharing with you all some photographs I took this summer at my favorite beach on the Amalfi Coast – the Santa Croce beach in Amalfi. Located just west of Amalfi, this heavenly beach is only a short boat ride away. (Or, if you’re feeling like some exercise, about 400 steps below the Amalfi Coast road.) During the summer, there’s a local boat service that runs throughout the day from Amalfi, and the ride only costs €2.00. Or, you can take the free boat service offered by Ristorante Da Teresa, the one with the orange umbrellas in the photos below, if you plan on dining in their restaurant or paying to rent a sun bed and umbrella. The beach at Santa Croce is small, rocky and absolutely perfect. I think the water is perhaps more beautiful here than any beach I’ve seen on the Amalfi Coast. Now do you you believe me? The larger rocks form a swimming area that is fun to explore, especially for kids who seem to love splashing around in the beautiful water. I’m usually off exploring the rocky area with my camera. I don’t know how this plant can survive the intense summer sun! There are few places on the Amalfi Coast that I find as peaceful as the Santa Croce beach. Sometimes I close my eyes and see this photo. I found a beautiful spot at the end of the beach and sat down for awhile watching the tiny crabs run back and forth on the rocks below. Not a bad view, eh? These are the summer days I’ll be remembering as the weather turns cool and I pack away the swimsuits, flip flops and beach hats for next year. But, until then, I’ve got the sound of the sea to carry me through until next summer, when I’ll be back at Santa Croce beach! If you want more tips and information on visiting the Santa Croce beach, check out the post I wrote last summer about my favorite beach on the Amalfi Coast. When I visited my friend Katie in Florence this past May, she was kind enough to meet me at the train station since it was my first time in Florence. After dropping off my bag at the hotel, my stomach rumbling reminded me that after the train ride from Salerno to Florence it was certainly time for lunch. When I asked Katie for a suggestion on where we should go, she responded with, “Do you want something cheap or something good?” I said, “Something cheap AND good.” Off we went to her favorite panino shop, which was a memorable and fun experience. I’ve tried to recreate that panino here on the Amalfi Coast, but it’s just not the same without the Tuscan prosciutto, pecorino and artichokes. Yum! Here’s Katie to tell you more about where to find the best sandwiches in Florence. Vinaino di Parte Guelfa opened about a year and half ago by two good friends, Luca and Leonardo, who happen to be brothers-in-law as well. Having done every job under the sun, they decided to open this delicious panino shop in the center of Florence. Both natives of Florence, they have now accumulated new friends from the city and all over the world. They tell me they enjoy speaking with folks that frequent the shop. Social interactions are what they thrive on! Sometimes it seems as if they are bartenders as well since every time I am in there someone is complaining about their life, while Luca and Leonardo add their two sense here and there and then let the client vent. It’s an extra bonus to be able to let all your worries and concerns out to your neighborhood sandwich extraordinaires. I entered this sandwich shop because of a recommendation from a friend. Often I’m nervous entering a new establishment in Florence since I’m very shy and it takes time before I feel comfortable with the owners and then can loosen up and talk up a storm with the clients and perhaps help out the tourists order. The shop is very small with only 2 tall and very tiny tables. Most people congregate outside on the curb during the busy lunch hour since there is no room inside. When arriving during the hours of 1pm to 3pm, expect a line. Don’t worry as it moves quite fast. Luca and Leonardo are very helpful and patient with each customer foreign or not. (Bare with them they are still learning English!) It is hard to decide when there are savory meats and tantalizing aromas making you second-guess yourself. The menu is small and versatile, offering you the choice between having a schiacciatina and panino . A simple panino with prosciutto crudo and pecorino fresco will run you only €2,50. If you are like me who like to mix tons of fresh flavors of Tuscany together, then it will cost you just €1 more, €3,50. Beverages consist of vino (wine), Fanta, Coca-Cola, water and beer. All will be from €1 to €1,50. I suggest the vino after a long day of walking in Florence! This delectable panino shop is located off the beaten path on Via Val di Lamona right near Mercato Nuovo. The street is very small and once you walk down it, you will see the token barrel outside the shop. That’s your cue that you’ve arrived at this scrumptious panino shop! This morning while shaking a rug out the window (Yes, I actually do that. ), our friendly neighbor called across the garden asking if we’d like some tomatoes. Of course! These neighbors have some terraces of land that they put to very good use and work hard every day tending all kinds of fruits and vegetables. It’s always a treat when they offer something fresh from their garden. When I went to pick up the tomatoes, I got a surprise dose of southern Italian generosity when I found the basket piled full of more than just tomatoes. She also shared some of their wonderful plums (better than any I’ve ever bought!) and the most delicious ripe figs. Oh my! This type of generosity is so common here in southern Italy. (And no doubt in the rest of the country as well, but this is only place in Italy I’ve lived.) Without any space for gardening, I often feel like I have so little to give in return for such generosity. So today, blessed with such abundance and kindness of neighbors, I want to share with everyone just how lovely, warm and generous the people of southern Italy are by their very nature. For many, something as simple as sharing an abundance of fruit is just as natural as saying buon giorno in the morning. 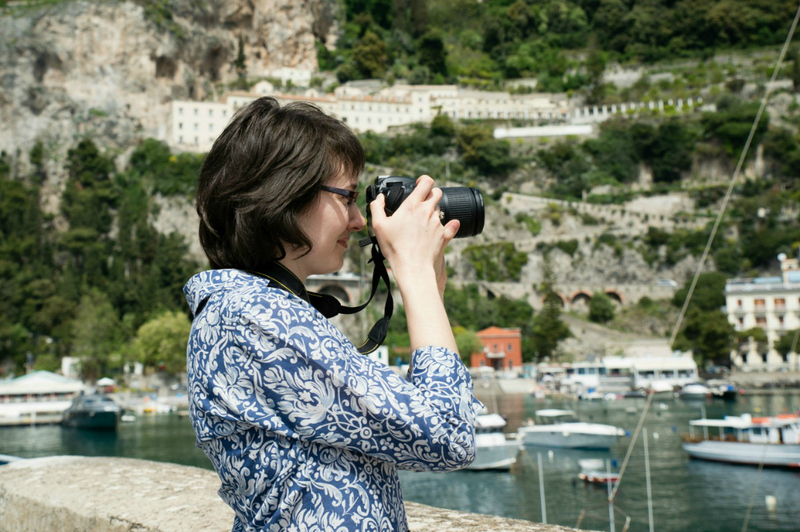 It’s something that I learn from and love every day here on the Amalfi Coast. Summer in Amalfi brings with it some of the most beautiful cruise boats, which stop in Amalfi’s harbor for a day or two. The most extraordinary is the Royal Clipper, the largest fully-rigged sailing ship in the world. With five masts and 42 sails, everyone in Amalfi stops to stare when the Royal Clipper comes into port. Earlier this summer it stopped in Amalfi on a windy Sunday afternoon, when I just happened to be sitting on the rocks watching a storm brewing off in the distance. Fortunately, the storm held off until all the passengers and tenders made it back to the Royal Clipper before it sailed away. Maybe next time I’ll catch a glimpse of those beautiful sails. Happy Friday and a good weekend to everyone! Have you all been following the Gita Italiana 2010 (Italy Tour 2010) over at Bleeding Espresso? If you love Italy, then this is the perfect chance to do some virtual traveling around the boot this month. Michelle has invited guest writers from all over Italy to write about where they live, and each day until the end of August you have the chance to read about another beautiful spot in Italy each day. Plus, she’s doing Italy themed book giveaways on Mondays until the end of the month! Really, does it get any better? I am honored to have been included in Michelle’s Gita Italiana this year, and I wrote Mountains & Sea: Between Two Worlds on Italy’s Amalfi Coast. Check out my article, and be sure to follow along on the Gita Italiana 2010!